Big L Lumber is Mid-Michigan’s Kitchen & Bath Headquarters. We have kitchen designers equipped with the latest computer design capabilities and a desire to make you kitchen & bath dreams come true. Big L offers free in-home consultations and measuring services. Contact us today to set-up your appointment. 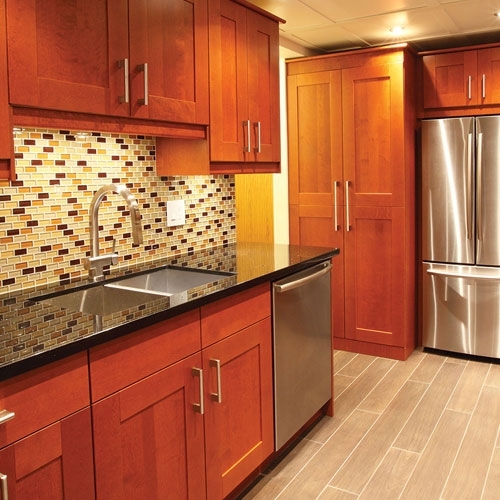 Big L offers quality kitchen & bath cabinets from Schrock, Aristokraft andModernView. Our designers can help you visualize the look and style you desire. Whether you want the rustic look of hickory and rustic alder or the modern look of maple and cherry we have you covered with the hundreds of options available in our different product lines. We offer the latest products available in kitchen & bath countertops at Big L.
Big L features laminate from Wilsonart, Formica and Pionite. These lines are available in both postform countertops that are ready to install and in sheet goods for the professional looking to create their own custom countertops. 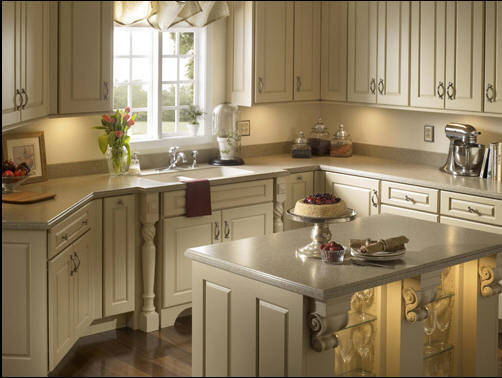 Over the past few years these companies have completely updated their product lines to include many new colors, styles and finishes to resemble to look of today’s stone surfaces. We also have acrylic solid surfaces tops available from Wilsonart, Corian and Hanex at Big L. These countertops give you the durability along with the look of today’s granite tops. For those looking for stone that is virtually maintenance free and beautiful to look at, choose from our great quartz manufacturers such asCambria, HanStone and Silestone. We also offer granite tops and while they do require some maintenance they’re the only product that gives that natural veining and beauty that simply can’t be replicated by a man made product. If you’re in need of a vanity top U.S. Marble is the perfect choice. U.S. Marble is a local company with its manufacturing facility right here is Remus, MI. The cultured marble, granite and onyx tops are second to none. They also offer many other products including shower walls and whirlpools. Here at Big L we have been offering quality products are great prices for 50 years. Make sure to visit you nearest Big L location and see for yourself how we can save you hundreds even thousands of dollars over those kitchen and bath specialty shops on the exact same products. Setup an appointment or bring in your design today.